One investor carefully tucks his returns away for the future, spending as little as possible now. Another budgets confidently for roof repairs in September and a mid-winter flight to the south, knowing the money will be there. Both are conservative investors. But investor #2 has discovered that being safe doesn’t mean being stagnant. You can have your cake and eat it, too. Smart conservative investing brings surprisingly powerful results through both income and capital gains. And you don’t need to take big risks. I’d like you to give you an opportunity to see why so many conservative Canadian investors rely on Canadian Wealth Advisor in today’s markets. Of course there is always some risk in investing. Right now, that’s true of the so-called ‘safest’ investments. Indeed, investors who insist on protecting their money from every risk can be like those who take shelter beneath a tall tree during a thunderstorm. The risk actually increases. Some investors tell me they are too old to consider the long term in their portfolios and shelter their capital in “safe” short-term instruments like Treasury bills (T-bills) or GICs or bonds. Others are simply averse to the ups and downs of the stock market. With GICs and bonds, you run the risk of seeing your money seriously eroded by the low interest rates that have prevailed for some years now, and possibly even more if inflation continues to creep up. That means that investments like GICs and bonds are like the tree in a thunderstorm. Investors could actually be worse off sheltering their capital in these investments than if they had taken just a little more risk—for the reward of much better returns. Whatever your age, or your situation, the bottom line is this. The only really safe investing is built upon profitable returns. Canadian Wealth Advisor is full of these safe investment opportunities that protect your money without sacrificing the potential for strong returns. And you get investments you know and trust. Financial institutions continue to cook up new investment products such as index-linked GICs that promise locked-in returns. But they usually deliver more in sales fees and commissions than they do in returns for investors (the fine print rarely works in your favour). I avoid these exotic products. Making money doesn’t need to be that complicated. 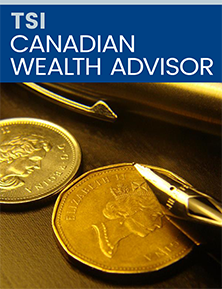 Subscribers to Canadian Wealth Advisor get straightforward advice on the best investments for a secure future. Stocks. We think investors will profit most — and with the least risk — by buying shares of well-established companies with strong business prospects. Almost exclusively, we favour conservative, dividend-paying stocks that will enrich investors with both income and capital gains. Exchange-traded funds (ETFs). These funds offer investors a great combination of low fees and top-quality stocks. What’s more, all of our ETF selections hold well-diversified, tax-efficient portfolios. Real estate investment trusts (REITs). REITs invest in income-producing real estate, such as office buildings and hotels. High-quality REITs can make attractive, lower-risk additions to your portfolio. As the only investment exempted from the 2011 income trust tax, REITs can continue to reward investors with rich cash distributions. Save $50.00 and strengthen your portfolio in all markets with Canada’s leading safety-conscious advisory. Click the button below to subscribe to Canadian Wealth Advisor and claim your 6 FREE Special Reports. If you are like many investors, the market volatility of recent years has made you more sensitive to risk. Sadly, many brokers cash in on this aversion to risk by offering products and strategies that seem to offer safety and stability. The reality is these investments usually make more money for your broker than they do for you. Example #1: Sophisticated options strategies that are designed to “protect” your stock portfolio by compensating for changes in price levels. The basic premise is that if a stock drops in price, certain options go up, so your overall portfolio value remains about the same. What they don’t mention is that your transaction costs are so high, you’re lucky to break even. Example #2: So-called “alternative investments,” like principal-protected notes. These complex securities carry hidden risks. Though the principal is guaranteed, the main risk is that you won’t earn a significant return during the term of the investment. Example #3: Certain insurance products, like equity-linked policies, which the law now lets stock brokers offer their customers. These may look good on paper because of what appears to be a link to the stock market. But once you understand how weak that link is (usually based on some convoluted formula hidden in the fine print), you’ll discover your gains aren’t anywhere near the projections. These are just three examples of investments that look safe, but are fraught with high risks and hidden costs. You’ll find complete details of these investor pitfalls (and ways to avoid them) in my new Special Report Bay Street’s Dirty Little Secrets. It’s a $25 value, yours FREE when you subscribe to my Canadian Wealth Advisor investment advisory. Today’s low-interest-rate environment has investors scrambling for ways to generate income. Some brokers are responding by urging their customers to buy structured investments. These are what I like to call Frankenstein investment products. They are created when a brokerage firm’s underwriting department takes genuinely desirable securities and cobbles them together in a new structured investment. These investments come with special characteristics, such as principal protection or a guaranteed interest rate, which make them superficially attractive to investors. Yet they also come with far more fees that in the end make them far more profitable for brokers. You may not lose much money buying these synthetic or “Frankenstein” investments. You may even make a few dollars. But it is certain that these investments will generate big underwriting fees for the financial institutions that concoct them. Then, when the structured investment gets redeemed a few years later, your broker gets an opportunity to do it all over again and sell you something new. However, there are investments out there that will deliver a decent return without an excessive amount of risk and without ongoing fees. With interest rates still at near-historic lows, it’s tough to find high-quality investments with high yields. Yet as I write this, there are REITs trading on the TSX that are yielding over 5%. Since 2011, when the government imposed a tax on income trusts that caused almost all to convert to corporations, Real Estate Income Trusts (REITs) have continued to benefit from the tax-free status that created the income trust boom in the first place. Their exemption from the 2011 tax makes them a popular choice for conservative investors. In Canadian Wealth Advisor, we continue to follow a group of former income trusts that have made a successful transformation back to corporate status. In the meantime, REITs’ high yields continue to make them attractive. Our recommendations among REITs offer attractive long-term returns at relatively low risk. Top-quality REITs also have good management and balance sheets strong enough to weather an economic downturn. They also have high-quality tenants, and they carefully match their debt obligations with income from their leases. The best ones continue to take advantage of low interest rates to refinance long-term mortgages. When analyzing REITs, I look at a wide variety of criteria. Each tells me something specific about the quality of the underlying properties and the likelihood that the REIT will be able to sustain—and increase—its distribution of profits to unitholders in subsequent years. You’ll find a more detailed explanation of this analytical process in my new Special Report Best Trusts to Hold Through 2011 and Beyond. It’s a $25 value, yours FREE when you subscribe to my Canadian Wealth Advisor investment advisory. Through a long period of low interest rates, the search for high income has moved away from GICs and other investments hampered by those low rates. Instead it has moved to stocks and trusts that pay substantial dividends and distributions. A REIT with close to 200 properties, a very interesting U.S. partnership and a yield over 6.0%. Canada’s largest REIT, which continues to profit from a powerful growth strategy and sustain a 5.0% annualized yield. A utility that is consistently able to generate strong cash flow, is making productive moves into renewable energy and yields over 4.5%. These are just 3 of the 9 investments profiled in my new Special Report 9 Safe Ways to Generate High Current Income. It’s a $25 value, yours FREE when you subscribe to my Canadian Wealth Advisor investment advisory. Exchange-traded funds, or ETFs, are more appealing than ever before. That’s because ETFs have evolved, mainly because of increased competition. ETFs are set up to mirror the performance of a stock-market index or sub-index. They hold a more-or-less fixed selection of securities that are chosen to represent the holdings that go into the calculation of the index or sub-index. These funds are not actively managed, so their management fees are quite low. ETFs trade on stock exchanges, so you can buy or sell them any time the exchange is open. You can buy ETFs on margin, or sell them short. You still pay brokerage commissions to buy ETFs, although over the longer term these would be offset by the lower management fees that ETFs charge. There are now ETFs that cover every major North American stock market index and sector. That makes them a great way to hold the stocks in the TSX, S&P 500 and many other Canadian and U.S. markets. As well, the past decade has seen the launch of many international ETFs. These can be a convenient way for North American investors to access the high profit potential of emerging markets as they mature. Even so, investing outside of Canada and the U.S. can expose you to more volatility and risk. That’s why I still think the best way for most investors to access these areas and cut costs is by purchasing high-quality international ETFs. In my Special Report, 5 Real ETFs for a Strong Conservative Portfolio, I cut through the increasingly crowded field of ETFs to show you where the real value lies. And I identify five strong, simple ETFs that are a winning addition to any portfolio. A $25 value, this Special Report is yours FREE when you subscribe to Canadian Wealth Advisor. To find stocks that meet my safety-first requirements, my staff and I apply stock picking discipline that has carried me through four decades in the investment business. Our patient, methodical approach is designed to uncover stocks whose built-in value limits investors’ losses during downturns. The stocks we locate are particularly resistant to the steep declines that so many conservative investors dislike. Although they sometimes experience price declines just like other stocks, they tend to drop less and recover faster. Of course, the same factors that prevent a stock from plummeting can also propel it higher. Stocks that can withstand the worst the market has to offer are consistently the first to rise when the market recovers. In my four decades of investing, I have seen every sort of stock picking system. Believe me when I tell you that you can have more confidence in our proven approach than any others. You’ll find a detailed explanation of my system in Pat McKeough’s Secrets of Safe Investing. It’s a $25 value, yours FREE when you subscribe to Canadian Wealth Advisor. At Canadian Wealth Advisor, we always focus on protecting your “safe money”—the part of your portfolio you’re counting on for the future—without sacrificing the potential for strong returns. To help you achieve your goals, we recommend that you hold the bulk of your money in well-established stocks, or in exchange-traded funds that hold those stocks. However, circumstances often require some investors to keep a portion of their money in even lower-risk investments. Even so, you’ll still want to earn more than the return on the average savings account or GIC. That’s where my new report, 3 Super-Safe Investment Opportunities, comes in. If you’re looking for much lower risk investments, you’ll want to add these three to your portfolio immediately. Only a select few investors know about the investments that I reveal in this exclusive special report. These investments have the potential to bring you great profits in the coming months, but even better, all three meet my stringent safety-first requirements. You can read all about these three much lower risk investments in my Special Report, 3 Super-Safe Investment Opportunities. It’s a $25 value, yours FREE when you subscribe to Canadian Wealth Advisor. We focus on low-volatility investments that can help conservative investors enjoy solid returns in almost any market environment, without losing sleep. But the secret to successful investing isn’t just to have a collection of various investments. The key is to have a combination of investments that will work together to tame volatility and help you meet your financial goals. That’s why my safety-first approach helps give you easy direction on how to properly diversify your portfolio, reducing risk and encouraging growth. Readers tell me that, in addition to providing typically reliable recommendations, Canadian Wealth Advisor acts as a sort of “second opinion” on investments recommended by their brokers. As you can see, the information we provide in each monthly issue can not only prevent you from making some serious investing mistakes, it can help you generate substantial returns while reducing risk. But the best way to appreciate Canadian Wealth Advisor is for you to experience it firsthand. If you ever feel that Canadian Wealth Advisor is no longer for you, you may cancel anytime and we will return 100% of your money on unserved issues whenever you ask. Everything you’ve received from us is yours to keep. You have no risk. Please don’t delay. Subscribe now.